Motto: Honi soit qui mal y pense - "Shame upon him who thinks evil of it"
If you are planning or thinking about leaving the Life Guards or have already have done so, then contact us today and we can give you advice and contact employers suitable for your skills and experience. Let us help you take the first steps to a new career. The Life Guards make up part of the Modern British Army and are part of the Household Division. They can trace their roots back to the 1660s and the time of King Charles II and his restoration to the throne of Great Britain. Initially to be part of the Life Guards you had to be a gentleman and the regiment had no noncommisioned officers in their ranks. So if they had corporals in their midst, they would be commissioned and were given the rank of lieutenant in the eyes of the rest of the army. The regiment first saw action in the Battle of Sedgemoor in 1685 on the side of the King James. After see much action in the First World War, 1918 saw them relinquish their horses and they were transformed into machine gun battalions, becoming the Guards Machine Gun Regiment. They saw action in World War I in such places called Arras, The Somme and Cambrai. In World War II they saw action again and fought in Iraq, Syria and Persia and also in liberating France in 1944. We are currently recruiting Security Managers, Supervisors, Controllers and Security Officers for prestigious sites in The City. Please send CV's to jameshutton@ultimatesecurityservices.co.uk or phone Jim Hutton on 07432102760. All Blue Red Blue Warriors WILL advance directly to Interview stage of the recruitment process. We have a selection of great employers advertising and looking for the right employees with the right skills and experience. 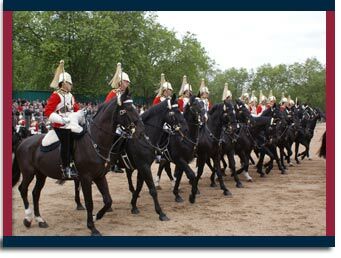 The Household Division comprises of the Life Guards, Blues & Royals, the Greandier Guards, Coldstream Guards, Scots Guards, Irish Guards and Welsh Guards.